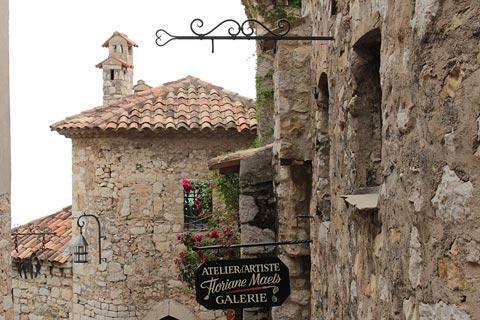 The medieval village of Eze is perched high on a hill above the French Riviera in south-east Provence from where it has lovely views along the coast and out across the sea. 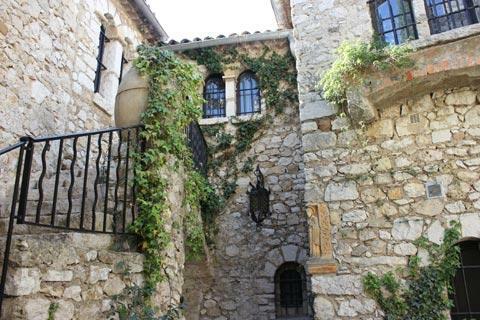 Although it is very close to the Mediterranean, including the resort at Eze-sur-Mer, because of its geographical position the village takes about 20-30 minutes to reach by car from the coast. 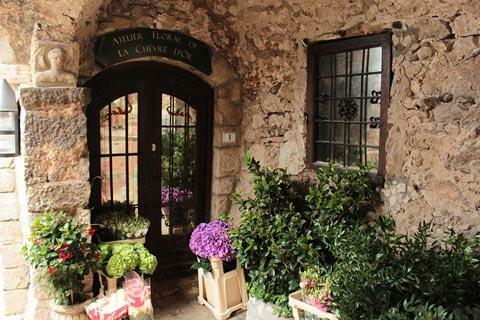 France This Way comment: in our opinion Eze is one of the most beautiful villages in France and an unmissable highlight of a visit to south-east France. 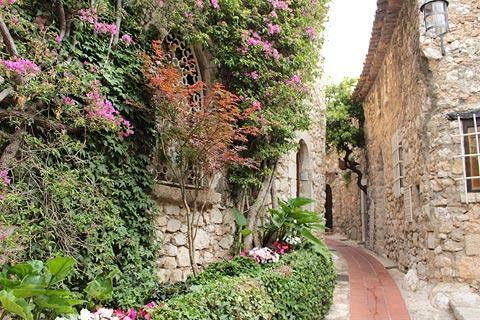 Due to the charm of the village, its tropical garden, and its proximity to the major resorts of the riviera such as Nice, it is true that Eze attracts a lot of visitors and can get quite crowded but that does not detract from the pleasure of a visit. 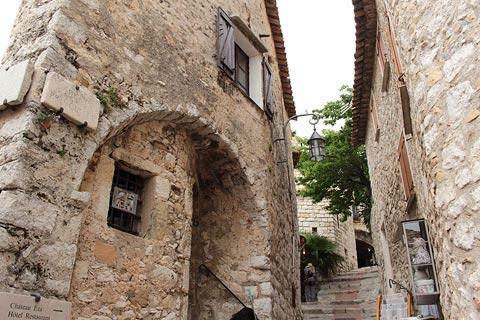 The whole medieval village is pedestrianised so you will need to park in the car park below. 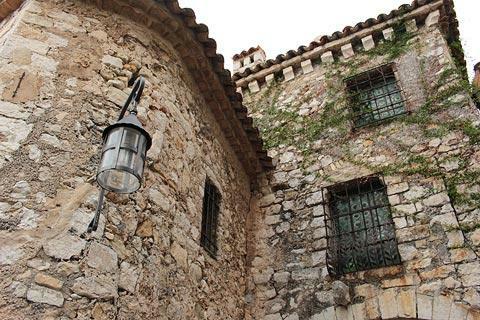 Next to the car park you can also find the Eze tourist office. The tourist guide have a useful map to help you explore and with information about the monuments to look out for in the village. As you walk up the hill towards the village you can see the church on the hill ahead of you, and you soon enter the narrow paved streets of the historic centre through the postern, a 14th century gate through the walls that protected the village in the 16th century. 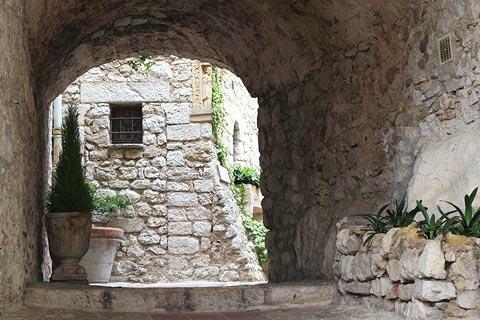 There are numerous streets and alleys to explore in Eze itself, with another beautiful courtyard or picturesque house to be seen and photographed around every corner. Many of these houses are now shops, restaurants or art galleries. I will not try to explain how you should navigate the labyrinth of streets because it would be too confusing, but I do recommend that soon after entering the village you take a walk along Rue du Barri, a quiet street to the left that leads to the Chateau de la Chèvre d'Or hotel: it is easy to miss this street and is one of our favourites in Eze. From here just keep walking up hill and exploring the many alleys and staircases and you will discover most of the places of interest sooner or later! 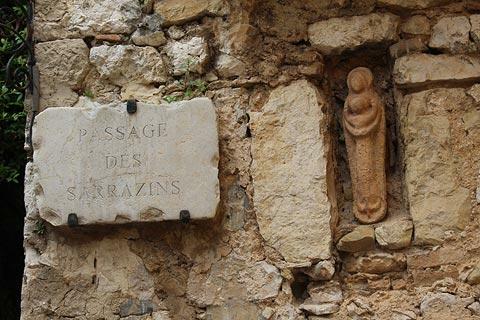 These include the Chapel of the Penitents Blancs, built at the beginning of the 14th century and the oldest building in the village and the Porte des Maures, a gateway out of the other side of Eze next to the Chateau d'Eza. 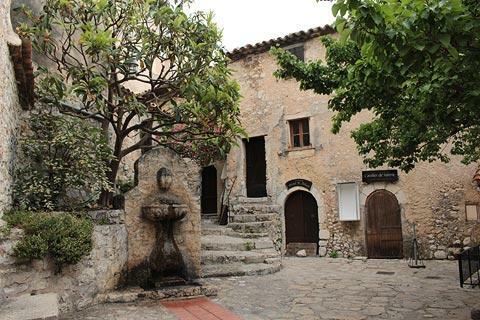 The streets around Place Francis Blanche are very picturesque and with several cafes and art galleries and the many plants and bouganvillea flowers, the small fountains and interesting windows and doorways all add to the charm of the village. 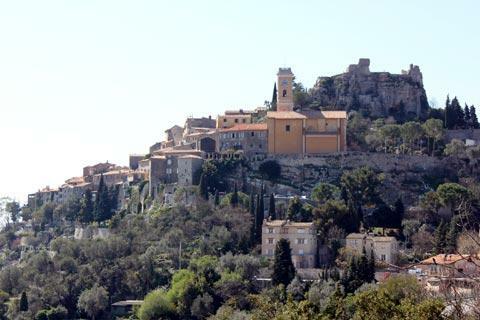 The rather orange church on the edge of Eze old village was built from 1764 - 1772 and has a neo-classical facade. The relatively plain exterior conceals an impressive interior where you can see several interesting decorative features including paintings and frescoes. The village is not listed among the plus beaux villages in France which includes about 170 of the most attractive villages in France. Of these we have visited more than 100 and believe that Eze should be in the top 10, not omitted altogether! France This Way comment: don't visit Eze and choose not to pay to enter the gardens, you don't know what you will be missing! On a clear sunny day this will be the best six euros you spend all visit! 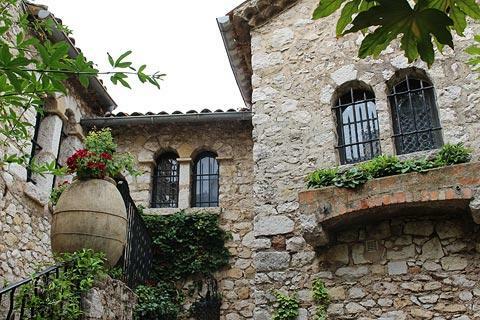 When you get close to the top of the village you will see the entrance to the exotic gardens which have been established in the ruins of a medieval castle. 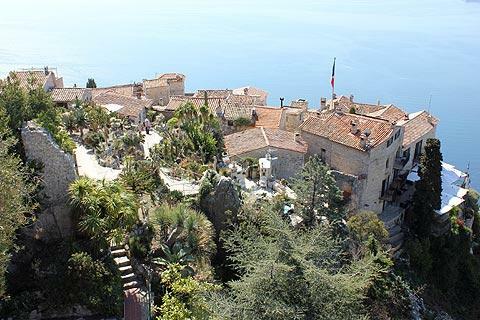 Although little remains of the castle itself, the semi-tropical gardens are superb and the views across the village rooftops and the coast are exceptional and more than worth the admission price. 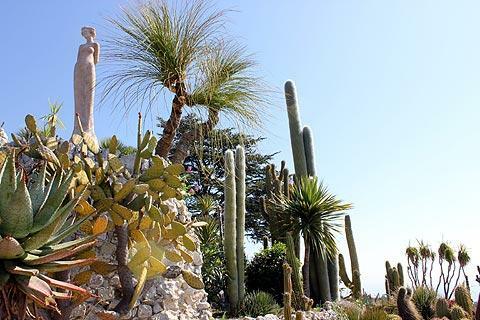 The gardens include a wide range of cactuses and succulent plants and areas for rest and relaxation as well as a large Mediterranean garden. At the top of the garden you reach the belvedere and the best viewpoint of all across the rooftops of the village and the Mediterranean. From here you might also notice the small belltower above the rooftops - this is the small Chapel of Penitents Blancs. 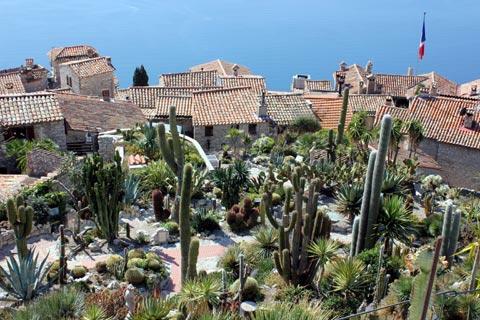 See Exotic garden of Eze for details. 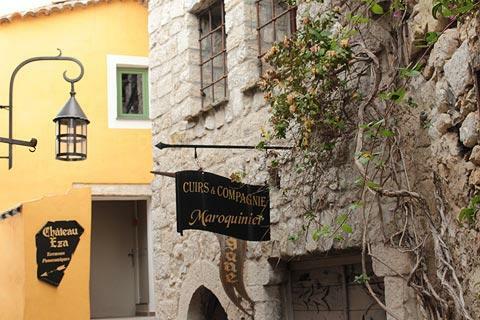 We visited Eze in March and the village was already very busy and parking was difficult. We visited again at the end of May and parking had not got any easier! The car park is quite small and there is nowhere to park on the streets heading out of the village. Even better, you could stay in the village. 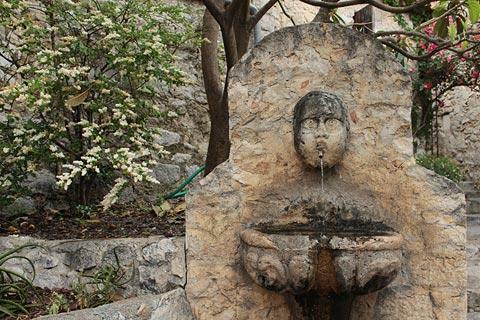 There are two exceptional hotels in Eze: you will see lovely gardens of the Chèvre d'Or as you climb towards the village and the Chateau Eza is a little further. These would be a magnificent way to enjoy the village, but are rather expensive. See Eze hotels for these (and others that are less expensive) in and near the village. 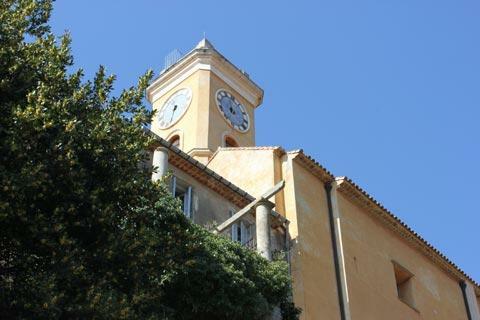 On the edge of Eze (just below the old town and hill) you can visit the laboratory-factory of Fragonard, one of the leading producers of perfume in France. A visit is free and the site is open every day of the year. At nearby La Turbie you can see the 2000 year old Trophy of the Alps: La Turbie is on the corniche road that follows the coast of the Riviera and has beautiful views across the Mediterranean. 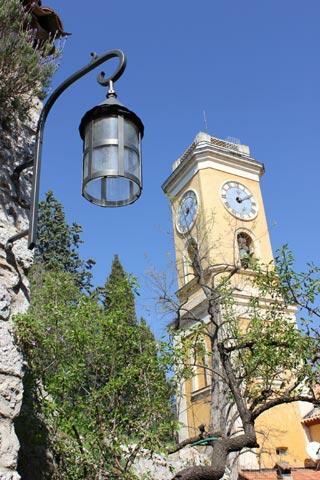 On the coast we suggest a visit to Villa Ephrussi on Cap Ferrat. 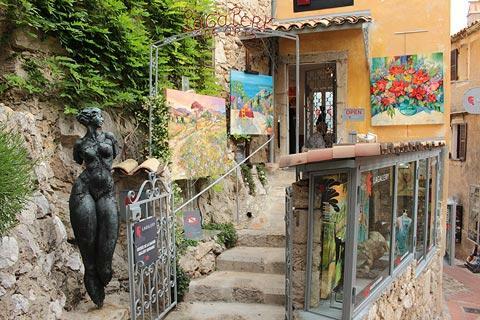 Another attractive medieval village in the region is Roquebrune, and within easy reach you will find many other famous destinations such as Nice and Monaco.